The nuclear industry has officially opened two National Response Centers — in Memphis, Tenn., and Phoenix, Ariz. 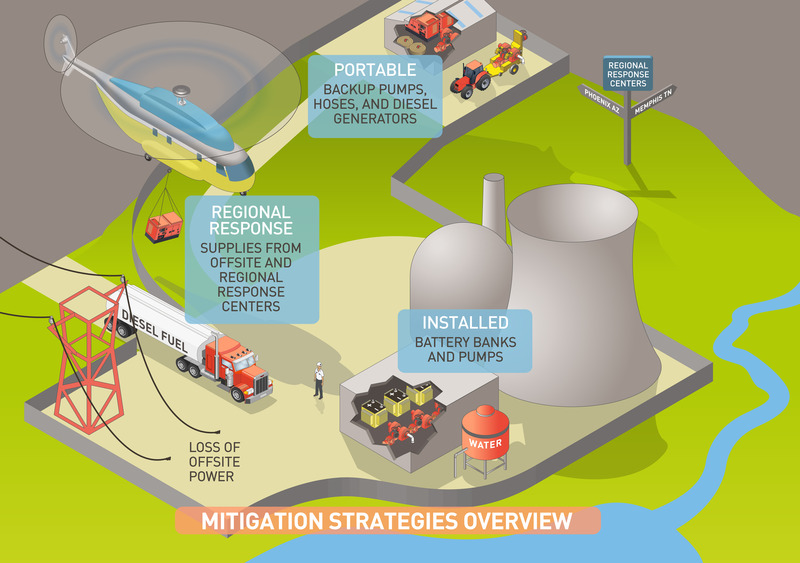 These response centers help U.S. nuclear power plants meet the requirements of the NRC’s Mitigation Strategies Order, which we issued after the Fukushima accident. The centers, previously called Regional Response Centers, contain extra equipment to duplicate plants’ emergency diesel generators, pumps, hoses and so on. This equipment would maintain plant safety functions for an indefinite period if an event disabled a plant’s installed safety systems. An industry group, called the Strategic Alliance for FLEX Emergency Response (SAFER), is managing the response centers. This organization also has two control centers that are separate from response centers and would coordinate equipment deliveries. SAFER has completed two exercises to demonstrate to the NRC they can get backup equipment to any site within 24 hours. NRC staff observed these “proof-of-concept” exercises. The first demonstrated transporting emergency equipment by road from the Memphis response center to the Three Mile Island Nuclear Station in Pennsylvania within the required time. The second exercise involved sending equipment by air from the Phoenix response center to the Surry Power Station in Virginia within the required time. The NRC staff watched to make sure the equipment can be successfully shipped and delivered. We also observed and evaluated the plants’ — and SAFER’s– communication and coordination throughout the exercises. The conclusions we’re drawing from these exercises will be one input in deciding whether the plants can meet the requirements of Phase 3 of the Mitigation Strategies Order. We’ll send the industry a letter reviewing the performance of the national response centers and SAFER this fall. While the NRC regulates the individual nuclear power plants that would request and receive the equipment, SAFER is not an NRC licensee. Nevertheless the NRC’s regulatory role does extend to the National Response Centers. Since the centers are key to how plants meet the Mitigation Strategies Order, we’re certainly interested in their performance. To expedite the availability of these Centers to respond, the NRC is working in parallel to design our regulatory oversight approach. Whatever the exact mechanism, you can be sure that the key consideration will be protecting the public’s health and safety. You can see our website’s Japan Lessons Learned section for more information about the mitigation strategy requirements and related guidance. We expect to send the industry a letter with our conclusions on the exercises. That letter should be publicly available in a few weeks. Are there reports available that document the results of the two SAFER exercises that the NRC observed? What if the sky falls down too? The NRC’s computers cannot affect U.S. nuclear power plant operations – the plants’ safety and control systems are physically isolated and have no Internet connectivity. The NRC also requires U.S. reactors to meet stringent cybersecurity requirements for other plant systems. What is the plan if something like this occurs and NPP just shut themselves down? Nuclear Regulatory Commission computers within the past three years were successfully hacked by foreigners twice and also by an unidentifiable individual, according to an internal investigation. That is a good first step, but what happens if the USA gets hit by a large EMF pulse, EQ and/or Grid failure which causes many nuclear power plants (NPP) and/or their reactors all to fail at the same time? This is not Sci-Fi, so ideally there would be a set of “spares” located nearby every NPP, only then should the NRC even consider they are prepared for large scale NPP failures. The cost to do this would be trivial as compared to even one NPP going BAD, as Fukushima proved on 03/11/11. Great addition to the US nuclear power plant safety toolbox! Now it is “One if by Land, Two if by Air”!